Lichtensteig and Basel but now home. Friday night I got to return to Lichtensteig, a small town about half an hour from St Gallen in the east of Switzerland. I’d previously played a house concert down the line at Watwil and also at Behind The Bush in Lichtensteig so I think that was the connection. FeinerFreitag is organised by Thomas and his friends - it’s a monthly evening of food and music at his wonderful house. A carpenter and a painter, his place was full of stocky furniture and figurative paintings on each wall. I rode seven hours down to the stop and he picked me up, drove the 5 minutes home and made me as welcome as could be. Much earlier on the first train I met Malena who was visiting her mother in Austria and was in possession of some of the most handsome Italian shoes I’ve seen. We chatted at the end of our shared journey, too briefly, and then she took me to a café in Munich for ridiculous donuts and cakes. She asked the name of my music thing but I changed the subject, I’m often ashamed or embarrassed or something I don’t know. It was daft not to at least exchange contact details as I’d enjoyed the conversation, her shoes and the donut, but so it is sometimes. Anyhow, sat on some more trains, grew alarmed at the amount of thick snow the further south I got and realised an old suit and no jacket were probably insufficient for Switzerland in March. Trains and music venues are warm went the thinking. So, the concert in Lichtensteig. Two big tables with local friends and strangers, delicious winter salad and lasagne and many cold bottles of wine and beer. I played three sets, I think - kind of in between the courses and after the food. Got to sing some songs I rarely do because it was a super sit down and be quiet kind of deal. Also a lovely bunch of people knew some of my things so they asked for a song and that set me to thinking of others. 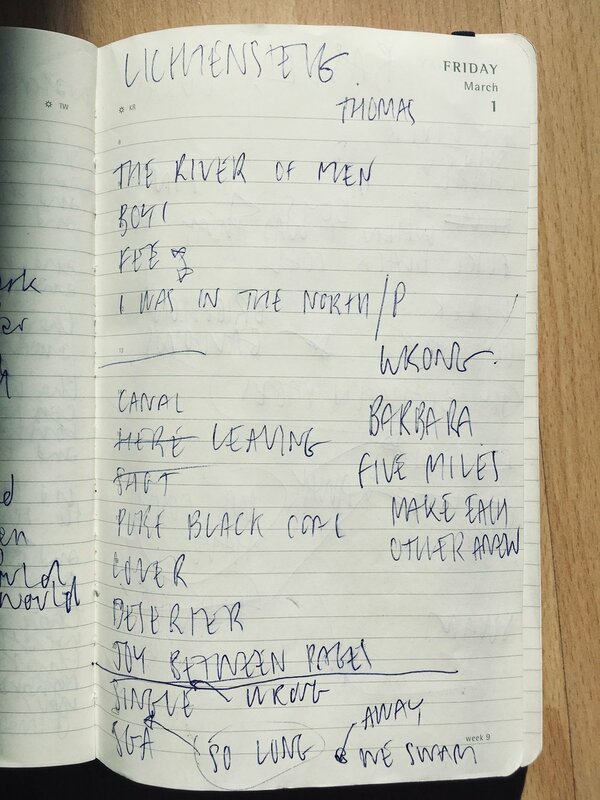 I played a new song ‘There Is Joy Yet Between The Pages’ that has been finished once but will change a little more and seems to be fairly liquid and malleable at the moment, which is a fun state to be in. Anyhow, was nice and pleasant and perhaps I missed out a little on the wonderful meal everyone was enjoying but a lovely evening nonetheless. Next day, after a lazy morning and a delicious breakfast and twenty minutes playing with the cat I walked down the hill and across the bridge to the small train station and a ride across country to Basel. We were taken to eat at Hirscheneck and had a brilliant meal there. Great atmosphere, very loose and friendly and delicious food. Spitting sausage. I suppose everyone in town knows the place but it was somehow new to me and I liked it there a whole lot. That evening’s concert was downstairs in the Irrsinn Bar, in the Loch - super smoky, tiny, dark and lots of fun. Lukas stood up and sang and had new things and then I sat down and played for what seemed like ages and ages. Some people in the audience knew a few of my songs which is always surprising so I tried to play those. I did ‘Brighton Gallows’ for Chrigel, ‘When I Was Away’ for someone and ‘We Could Have’ for someone else. Later and away from the smoke the conversation turned to Ireland, Flat Earth Theory and the Sussex Panther. I dragged myself home late and then realised I had forgotten my scarf and hat so dragged myself right on back. I’m home now, watching the wind blow the pigeons every which way. It’s Monday afternoon and I’ve more concerts this week. You alright?